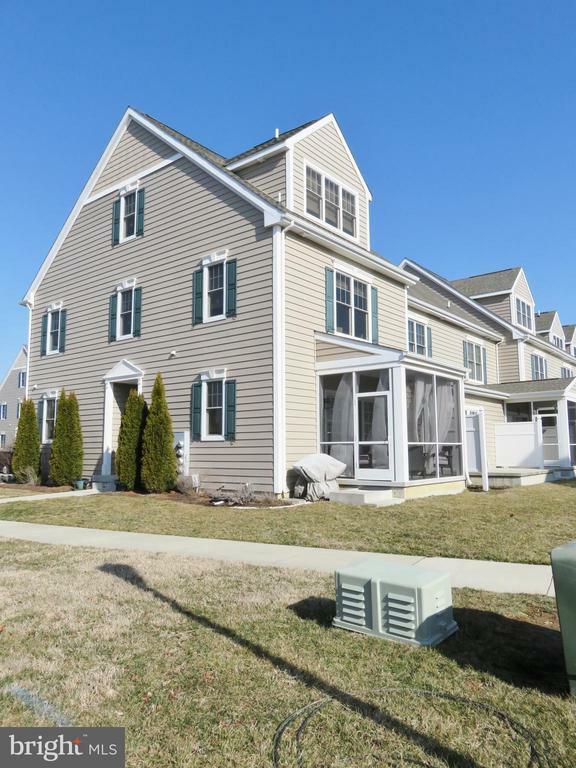 Located close to the outlets and adjacent to a golf course in Lewes, this 3 bedroom, 3.5 bath townhouse shows like a model. When you enter, you will notice hardwood flooring throughout the main living area which is designed around an open concept floor plan, perfect for entertaining. The chef in the family will love the gourmet kitchen with its ample workspace, granite countertops, maple cabinets, tiled backsplash, stainless steel appliances and pantry. The large island with its overhanging counter provides additional seating adjacent to the dining area. For cold winter nights, there is a gas fireplace in the living area and when the weather turns warmer, you can relax in the screened porch with views of a pond. The second floor has two large bedrooms, each with its own bath and walk-in closet. Capping off the townhouse is a third floor master suite with a sitting area, tiled master bath with a walk-in shower, a large walk-in closet and attic storage. The furnishings are included in this tastefully decorated townhouse. All you will need to bring to your new home is your clothes and groceries!